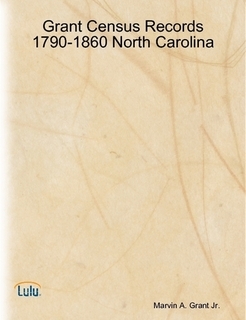 There were many Grant families in North Carolina in the late 1700's and early 1800's. I have transcribed all the Grant entries listed on the Federal Census Records for North Carolina for the years 1790, 1800, 1810, 1820, 1830, 1840, 1850 and 1860. The early census records only list the name of the head of household, but the 1850 census was the first to list every member of the household by name (except slaves.) For the 1850 and 1860 census I have only included the Population Schedule, Mortality and the Slave Schedule. The others (Agriculture, etc.) are not included. If there is interest, perhaps I'll add some of those in a future edition. Edition: Third (15 Jul 2008); originally published 2003. If you wish to pay by check or money order you must order it from me via snail-mail. Send $21.00 to me at: Marty Grant, 3291 Alton Phillips Road, Kinston, NC 28504. The price for snail-mail orders includes shipping and handling. Once your check has cleared I will order the book for you and have it shipped to your address.